Our patented system offers more features for less money, making it the best solution. At Total Basement Finishing, we're your one-stop source for everything you need to finish your basement -- including your basement walls, floors, ceilings, windows, staircases, dehumidifiers, and more! We pride ourselves on creating a beautiful, customized touch to each of our completed projects. 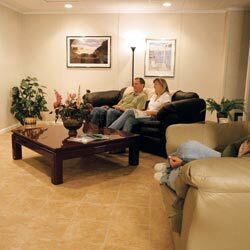 Because there are so many options when remodeling a basement (and because most people do not opt to finish the entire space), prices can vary based on the homeowner's preferences. To help you customize your finished basement, we provide professional, on-site basement finishing quotes at no cost or obligation to you. Each quote includes an inspection and measurement of your basement, where we map out the dimensions and potential obstacles such as staircases, windows, and utilities. What would you do with a new floor of additional living space -- one that was customized in any way you'd like? The Total Basement Finishing™ System, installed by our in-house staff here at Total Basement Finishing, is the ideal way to finish your basement. Our system includes a waterproof design that does not support mold or mildew, while featuring industry-leading wall insulation. When it comes to basement finishing, we can provide the complete package -- including floors, walls, ceilings, staircases, egress windows, lighting, and much more. A typical installation of our complete remodeling system is completed in 7-10 days. Your expert will work with you to customize your ideal finished basement, designing the space on our innovative 3-D software. Once your finished basement has been created, our software will provide you with a cost quote for the completed work -- available in writing. If the final cost doesn't match your budget, we can go back and revise the system until it does! As an added convenience, we'll mail along a copy of our full-color book, Basement Finishing Science, for you to browse before our scheduled appointment. This book is packed with information about basement finishing, as well as details about our available products and services. 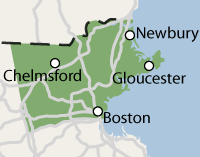 We offer our free quotes to homeowners throughout our Greater Boston service area, including Boston, Lowell, Cambridge, nearby Lynn, Somerville, Lawrence, Framingham, Waltham, Haverhill, Malden, and many surrounding areas. Contact us by phone or e-mail today to schedule your free appointment! We offer a variety of home improvements and repairs for individuals who need work done on their below-grade spaces. Whether you're looking for remodeling or waterproofing basement, our certified professionals are here to help you!